The murky brown water was filled with dead cows and fallen trees. The wind was gusting and white caps were forming. 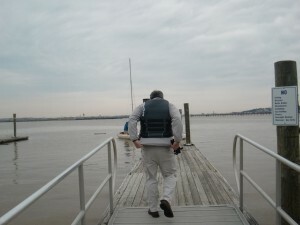 Rob Gosselink’s determination since 10:22am to keep on a southeasterly course across the Potomac suggested he was aiming at Bolling Air Force Base and his arrival at 10:24am at a small inlet with a Marine jogger certainly fit the bill. Gosselink would have known even from Frazier’s published account of the 1973 Penabscot Potomac cross-river voyage that he would first encounter sand banks a few dozen yards offshore, where Penabscot initially had grounded temporarily in a roadstead he named Watergate Shallows before proceeding eastwards into the small bay. With Harris casting the lead up front and yelling back the depths (and other such advice as “mind your clew,” “weather your forelock,” “you’re luffing,” “damn your eyes, you jackanape!”), the M16 sailed on. But Gosselink was not at Bolling. He was at both the wrong latitude and on the wrong coast. The M16 had fetched up at the shallows off Founder’s Park on the west bank, and the Marine jogger wasn’t a jogger at all, but a sculptor from the Torpedo Factory out looking for found art. Lacking the binnacle and chronometer normally mounted in Mr. Whistlebritches, Gosselink had committed the same essential error made two days earlier by Father McMurty and his teenage group of new church leaders as they beat back and forth in their Flying Scott against the strong Maryland nor’wester to gain the sanctuary of the Anacostia. Did Gosselink know where he was headed—and have every intention of pausing at the Alexandria paddle wheel steamboat before proceeding upriver? Alternatively, did the mistake occur to him only after he left the east bank of the Potomac, when the geography that then unfolded indicated that he already had been on the west side of the river for at least minutes? It didn’t matter. It would soon be 11:00am, and somewhere in the mist to the northwest, somewhere beyond the murky brown swells, Karen waited with grilled cheese sandwiches. The morning tide had turned, spring was only a few days away, and Gosselink knew that if he did not make the right decision soon, Karen would eat the sandwiches. It was just then that Harris suggested they tack away from the dock Gosselink was about to crash into. It was the flash of inspiration Gosselink had been seeking. You got off easy, as the Harris/Currie wardrobe police usually require blazers, but perhaps that’s only when the menu is watercress sandwiches on crustless white bread. He’s right about Karen though. She WOULD eat all the sandwiches. Anxiety is a great motivator – probably her game plan all along. Was Stew wearing his matching ascot/cordoroy trouser ensemble? You know the ones that make the whistling sound with each stride.